Winter Camp Registration Starts TODAY! It is one of the best times of year to get out into the parks and see the sights and enjoy the weather change. The park is currently buzzing with the visiting warblers and other migratory birds. Yesterday the bird baths had lines forming. Visit our calendar for a list of upcoming opportunities to experience this wonderful time of year at the park. Most of our programs, you can now reserve online by visiting the following link, https://rms.miamidade.gov/RMS7/Activities/Search.aspx, select “Arch Creek Park” in the Place search field. Even our shelter can be reserved for your next party or gathering online at https://rms.miamidade.gov/RMS7/Facilities/MapView.aspx, select “Arch Creek Park” in the Location search field. 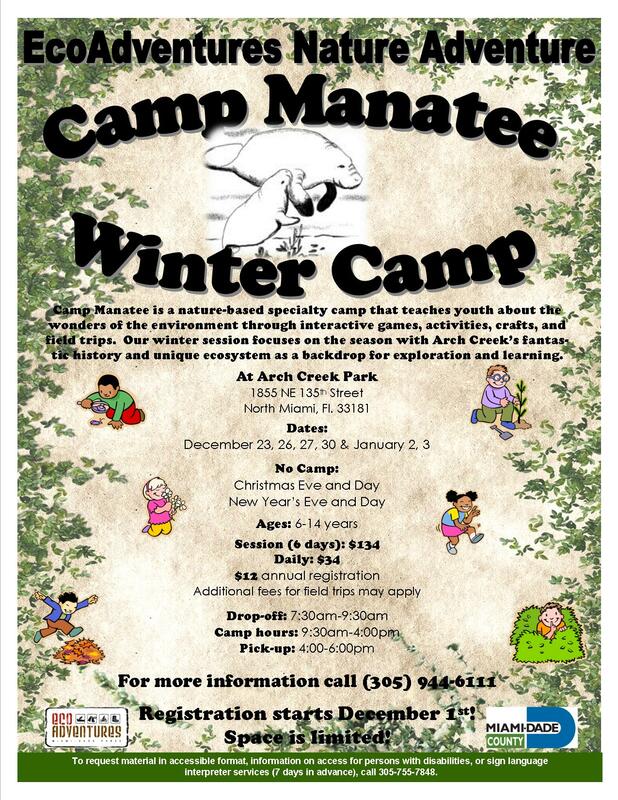 Arch Creek Park will be offering Camp Manatee Winter Camp this year, look out for an email announcement for dates and fees. We hope to see you all at the Park! Camp Manatee is offering a special deal for the 2012-2013 Winter Camp season. If your camper(s) will be attending both sessions, the cost will be $134 for the 6 days. the additional fees, weekly transportation and annual registration, will still apply. Camp Manatee – Winter Session! 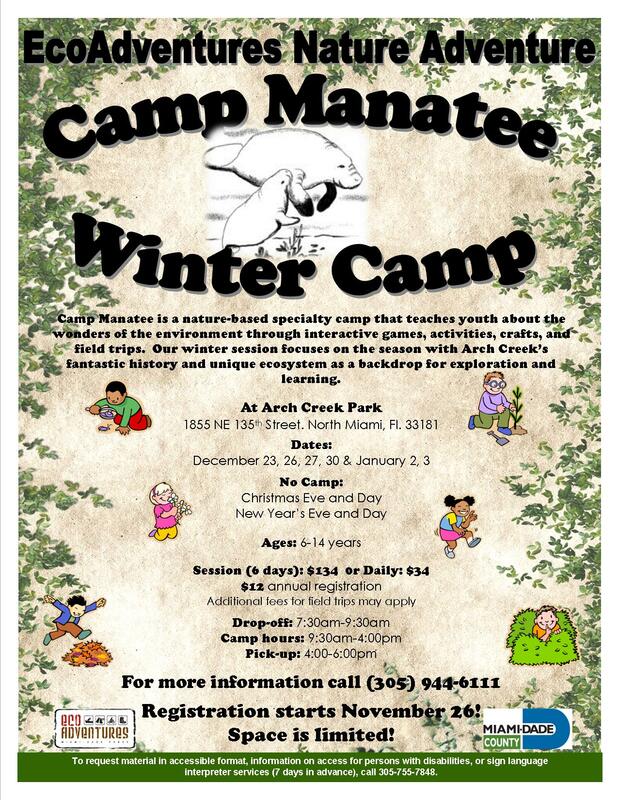 Camp Manatee – Winter Camp will be held at Arch Creek Park for two 3-day sessions. Session 1 – Wednesday, December 26th- Friday, December 28th, 2012 and Session 2 – Wednesday, January 2nd – Friday, January 4th, 2013. Registration begins Monday, November 26th, call to schedule an appointment to register your camper(s). 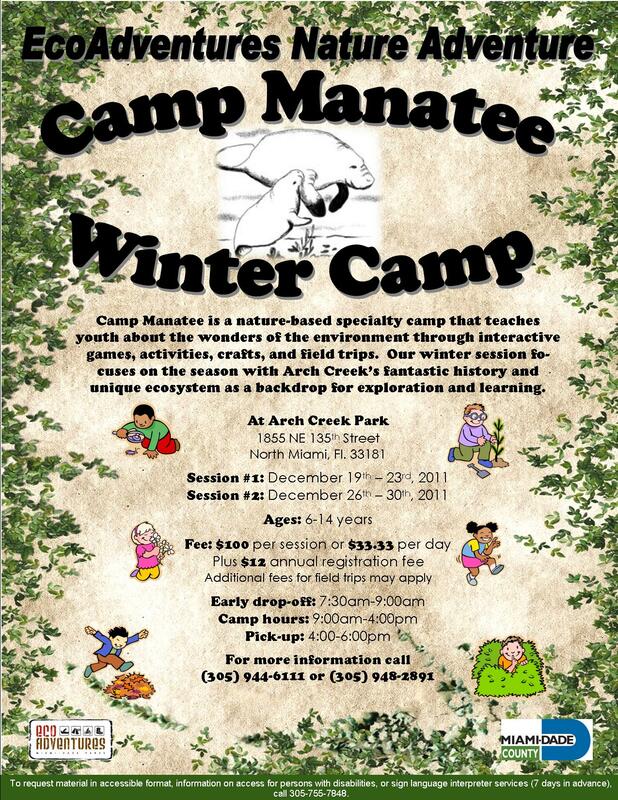 Arch Creek Park will be hosting camp during the 2 week winter recess from Miami Dade Public Schools. The 2 week sessions will be: Week 1: December 19th – 23rd and Week 2: December 26th – 30th. Registration has started. Contact the park to get more information on how to register. The schedule will be posted shortly on the Camp Page.